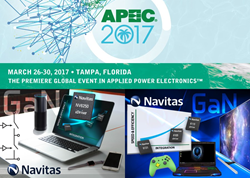 Navitas Semiconductor announced today that the company's recently launched GaN Power ICs will be featured in ten technical papers and industry papers at the Applied Power Electronics Conference and Exposition (APEC) held at the Tampa Convention Center, Tampa, Florida, March 26th – 30th, 2017. Technical papers highlighting Navitas GaN Power ICs across a broad range of applications from 25W smartphone chargers to 3kW data centers are presented by Stanford University, North Carolina State University, University of Tennessee Knoxville, Intel, Texas Instruments and Navitas. “APEC is the perfect opportunity to witness first-hand the smaller size, faster-charging and lower system costs enabled by GaN power ICs over a wide range of power applications,” commented Navitas VP of Sales and Marketing, Stephen Oliver. “Demand for the single and half-bridge GaN Power ICs has been intense, and we anticipate exciting one-on-one reviews with customers and industry partners,” Oliver added. Navitas Semiconductor Inc. is the world’s first and only GaN Power IC company, founded in 2013 and based in El Segundo, CA, USA.. Navitas has a strong and growing team of power semiconductor industry experts with a combined 200 years of experience in materials, devices, applications, systems and marketing, plus a proven record of innovation with over 200 patents among its founders. The proprietary AllGaN™ process design kit monolithically integrates the highest performance GaN FETs with logic and analog circuits. Navitas GaN Power ICs enable smaller, higher energy efficient and lower cost power for mobile, consumer, enterprise and new energy markets. Over 25 Navitas patents are granted or pending.